Using Oriented Strand Board is a tested way of reducing costs for building your shed. Plywood with similar properties currently costs about 30% more for an equivalent thickness. However, there are some sceptics out there who doubt the strength and durability of OSB. Could it be that these people have inadvertently used the wrong grade of material? Or possibly they haven't used the right thickness or followed simple guidelines to get the most out of this product. As with any material there are a few simple rules to follow to ensure that it performs as expected. With OSB there are two aspects to consider. Firstly, purchasing the correct grade of material and then following some simple dimensional rules to maximise the effectiveness of fixings. OSB sold in the UK is made to comply with BS EN 300 Oriented Strand Board (OSB) Definitions, Classifications and Specifications. It is a long document with many parts and subsections. So I will try and simplify what you need to know. For shed construction there are two commonly used grades of OSB: OSB2 and OSB3. The two grades of board look very similar and can only be distinguished visually by markings which are sprayed on to the board. Typical markings on OSB panel. Direction of text should run in direction of span. Both grades of board are manufactured to achieve the same values in laboratory strength tests. In general construction OSB2 is used for internal partitioning where there is very little chance of the board suffering damp conditions. 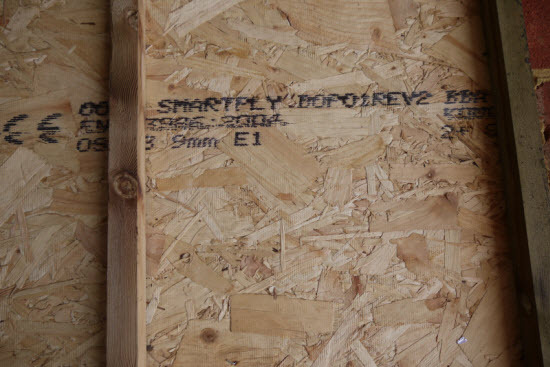 OSB3 is used more for the building envelope where there is a possibility of leakage or condensation occurring. One point that I found interesting was that the National House Building Council (NHBC) only permit the use of OSB3 for sheathing to walls, floors and roofs. I presume that this is as a result of poor experience with using OSB2. As you might have thought that suspended floors in a house would be about as dry as you could expect (except of course in a bathroom). 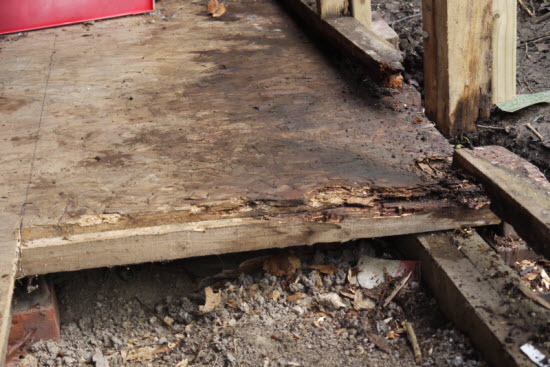 There are no specific UK regulations offering guidance on using Oriented Strand Board in sheds. Reading some of the OSB manufacturers guides, OSB2 is recommended for use in garden shed construction. However on chatting to some of the staff and sales people I believe that this advice is changing. Particularly as the cost difference to produce the two grades is now very small. In addition to strength tests samples of OSB2 are immersed in water for 24 hours. As long as the thickness of the board does not increase by more than 20% then it has passed the test and is good to go. The test for OSB3 is more stringent. In the water immersion test it has to swell less than 15%. A sample of OSB also has to pass a boil test OR a cyclical test. The boil test is just what it says a sample is immersed in boiling water for a few hours. After which the strengths tests are repeated. I won't bother you with the details of the strength test except to say that after the above 'mistreatment' it must still have just less than 50% of its originaly structural capacities. The cyclical test takes longer than the boil test. It involves repeatedly soaking a sample of board in water and then drying it in a kiln over a period of three weeks. When the test is finished its remaining strength is checked. The values to be achieved are similar but slightly less onerous than those of the boil test. To pass the tests the resin used in OSB3 needs to give the bonded wood strands a lot more resistance to water absorbtion and also the ability to resist repeated cycles of wetting and drying or the boil test. Does this sound like the sort of thing that might occur in your shed? You bet! When I repair sheds I frequently come across situations where there has been an un-noticed leak in the roof or long term water damage to the siding. In this sort of situation I would much rather have a material that is designed to resist moisture than one that has no such requirement. The picture below is an example of a shed I was recently asked to repair. Soil had been heaped up against the outside of the shed and some of the siding and floor joists had rotted. The OSB had rotted too but only to the same degree as the timber. The problem was solved by removing the offending soil heap and replacing the rotten timber and OSB. My point here is that OSB will rot when exposed to high levels of moisture, but just the same as any other timber or plywood. So best to err on the safe side and have the moisture resistant OSB3. In addition to selecting the correct grade there are a few basic fixing rules to follow to make sure that you get satisfactory performance out of your sheet material.